Background: Low back pain (LBP) in schoolchildren with no apparent clinical cause is known to be a common problem, but considerably less is understood regarding the aetiology of such pain. Aim: To assess the role of both mechanical and psychosocial factors (including emotional and behavioural problems and other somatic pain complaints) in childhood LBP. Methods: A cross sectional study was carried out in a population of 1446 schoolchildren aged 11–14 years. Information on these potential risk factors for LBP was sought using a self complete questionnaire and a five day bag weight diary. Results: Mechanical factors such as physical activity and school bag weight were not associated with LBP. However, strong associations with LBP were observed for emotional problems, conduct problems, troublesome headaches, abdominal pain, sore throats, and daytime tiredness. Conclusion: Results suggest that psychosocial factors rather than mechanical factors are more important in LBP occurring in young populations and could possibly be a reflection of distress in schoolchildren. It is understood that low back pain (LBP) with no apparent clinical cause is common in childhood, but the aetiology of this pain remains unclear. Most of the epidemiological research has investigated mechanical and physical factors as possible causative mechanisms.1 A recent study found that Italian schoolchildren were carrying weights that exceeded the body weight/load ratio limits proposed for adults,2 and a number of studies have shown that backpack load was associated with LBP in childhood.3–5 Psychosocial factors have been implicated in other unexplained pain symptoms among children. A study conducted in Sweden found that psychosocial and emotional factors were more important than physical parameters in the reporting of childhood headaches and general joint and musculoskeletal pains.6 Others have suggested, as with adults, that adverse psychosocial factors may increase the risk of LBP in children.7 Under this hypothesis, LBP may be a manifestation of distress and commonly occur with other unexplained pain symptoms. The current study aimed to investigate the association between (1) mechanical factors and (2) psychosocial factors and LBP in schoolchildren. We also wished to determine to what extent LBP was associated with the reporting of other childhood pain complaints. We conducted a cross sectional survey involving secondary schools in two areas of northwest England: Cheshire and North Derbyshire. The Director of Education and local research ethics committees in each area approved the study. The survey area as a whole is mixed in terms of sociodemographic characteristics and includes both rural and urban communities. Schoolchildren in Years 7–9 (aged 11–14 years) attending either state or independent (fee paying) schools in the area were eligible to take part in the survey. This particular age group was chosen to simplify proposed data collection of LBP incidence at one year. When a school agreed to take part they were asked to provide either one or two classes. In schools which agreed to participate, data were collected between November 1999 and July 2000 to coincide with the British school year. Investigators visited each participating school to administer a self completion questionnaire to the children in participating classes and to make anthropometric measurements. 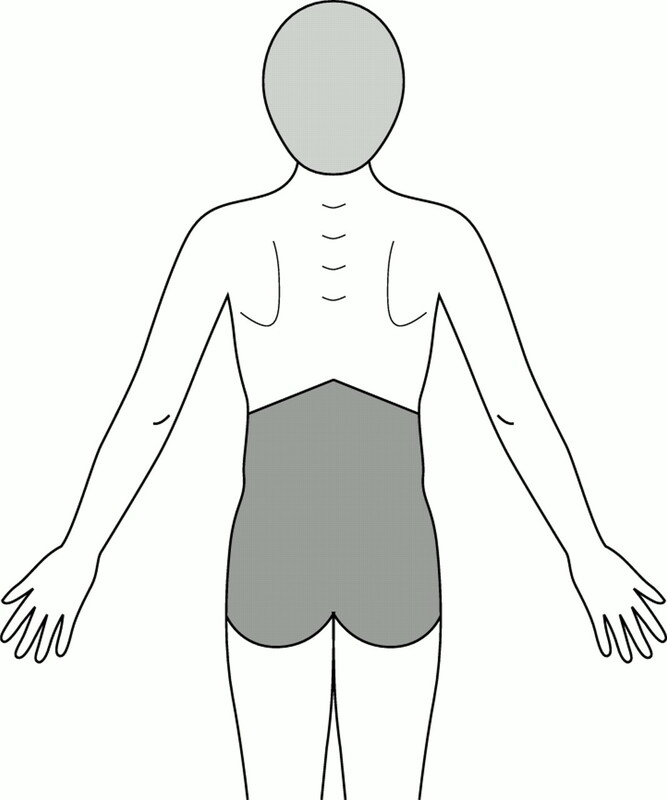 The questionnaire had been assessed in a pilot study and was found to be both reliable and comprehensible.8 We used two methods of assessment to identify LBP status: a direct question (“In the past month have you had low back pain which lasted for one day or longer?”) and a preshaded manikin question (“In the past month have you experienced pain in the shaded area which lasted for one day or longer?”) (fig 1). To fulfil our criteria for LBP, participants had to respond positively to both questions. Definition of low back pain according to preshaded manikin. Mechanical factors in this population were assessed by body mass index (BMI), school bag weight, part time jobs involving heavy lifting, and physical activity. During the school visit, investigators made anthropometric measurements on each participant, which included height and weight measurements (using a tape measure and calibrated Salter Electronic Scales) with a standardised procedure. BMI was calculated as the ratio of weight (kg) to height (m) squared and was transformed into quintiles for analysis. A five day bag diary recorded information relating to bag weight, method of carrying the bag, and type of school bag carried over a typical school week. Spring scales were left in each school for daily measurement of school bag weight. Average daily bag weight was calculated by summing the bag weight over each of the five days and dividing by the number of days. Data were then transformed into quintiles for analysis. Percent body weight carried was calculated by dividing the average daily bag weight by the weight of the child and transforming the data into quintiles. Schoolchildren were asked in the questionnaire if they had a part time job and if it involved lifting heavy items. Physical activity levels were assessed using closed questions relating to type, frequency, and duration of 17 types of sporting activities during the past week. This allowed the total time participating in sports to be calculated (and was analysed in tertiles). Sedentary activity levels were assessed by combining the amount of time spent watching television and on the computer during the past day. The data were then transformed into quartiles. The Strengths and Difficulties Questionnaire (SDQ) was used to measure psychosocial factors.9 The SDQ is a short behavioural screening tool which provides coverage of adolescents’ behaviours, emotions, and relationships. It includes five separate dimensions (each scored out of 10)—four relating to negative behaviour or “difficulties” (hyperactivity, conduct problems, emotional problems, and peer problems), and one focusing on positive behaviour (strengths): the prosocial dimension. The psychosocial measure (the SDQ), has been assessed previously in a community setting of children aged 11–14 years and found to be a valid and reliable instrument for measuring behaviour.9 For analysis purposes, each dimension of the SDQ was transformed into tertiles. Schoolchildren were asked on how many days in the past month they had experienced troublesome headaches, abdominal pain, and sore throats. Daytime tiredness was measured using a visual analogue scale (0–100 mm) relating to usual levels of tiredness; all were analysed as tertiles. Logistic regression was used to quantify relations with LBP using odds ratios and 95% confidence intervals. Significant results from the univariate analysis (p < 0.05) were then entered into a multivariate model to establish factors that were independently associated with LBP. All analyses were conducted using Stata software (Statacorp, 1995). Eighty schools were identified in the study region, of which 39 agreed to participate in the study. This gave access to 56 classes which totalled 1496 schoolchildren. In total, 1446 of 1496 eligible schoolchildren took part, giving a participation rate of 96.7%. Reasons for non-participation included 13 children who were not given permission to take part by their parents and 37 children who were absent on the day of the survey and did not respond to further contacts. Boys represented 46.1% of the sample (n = 667). The LBP questions were fully completed by 1376 schoolchildren on which the following analysis is based. The one month period prevalence of LBP in the study population was 23.9% (n = 330). Girls reported higher prevalence rates than boys (28% v 19%; χ2 = 14.7, p < 0.001) and, in both genders, prevalence increased significantly with age (girls: LBP at 11 years, 18%; LBP at 14 years, 34% (χ2 trend = 13.5; p < 0.001); boys: LBP at 11 years, 14%; LBP at 14 years, 25% (χ2 trend = 7.3; p = 0.007)). No evidence of an association was observed between BMI and LBP (table 1). The median five day average load, of those schoolchildren who completed and returned the bag diary (n = 1132, 78%), was 4.5 kg (IQR 3.6–5.9 kg). The individual five day average loads ranged from 1.2 kg to 18 kg with almost three quarters of children carrying loads between 2 and 6 kg. There was no relation however between average load carried and the likelihood of reporting LBP (table 1). The rucksack was the most common type of bag carried to school (73%) and one shoulder (50%) was the most common method of carrying the school bag. However, LBP was not significantly associated with either the type of bag carried or the method of carrying (data not shown). The median average load was 9.7% of body weight (IQR 7.1–12.6%). In total, 91 (8%) children were carrying loads greater than 8 kg, representing approximately one fifth of their body weight. However, there was no significant relation between percentage body weight carried and the likelihood of reporting LBP. Indeed the lowest risk was reported among those carrying the highest percentage body weight. The amount of schoolchildren reporting having a part time job was 25% of the sample (n = 320). Children who had a part time job had a 60% increase in odds of reporting LBP (OR 1.6, 95% CI 1.2 to 2.2), although among those with a part time job there was no association with reporting lifting heavy items (OR 0.8, 95% CI 0.5 to 1.4). There was a modest and marginally significant association between the top tertile of time spent playing sports (>4 hours per week) and reporting low back pain LBP (OR 1.4, 95% CI 1.02 to 1.9) (table 2). On analysis of the relation between each of the 17 individual sporting activities and the reporting of LBP, positive relations were only observed for roller blading (OR 1.4, 95% CI 1.1 to 1.9) and rugby (OR 1.8, 95% CI 1.2 to 2.6). Furthermore, no associations were observed between amount of sedentary activity (that is, watching television, using computers) and LBP (table 3). Table 4 shows the relation between psychosocial factors and LBP. A high score on the four “difficulties” dimensions shows increased levels of difficult behaviour, whereas a high score on the “strengths” dimension shows high levels of positive behaviour. After adjusting for age and gender, children reporting higher levels of all four “negative” behaviour categories were significantly more likely to report LBP. Children reporting conduct or emotional problems had a threefold increased odds of reporting LBP, and those scoring higher on the hyperactivity and peer problems scales had a 50% increased odds of reporting LBP. Prosocial behaviour (which is the “positive” behaviour measure) was not associated with LBP. Strong associations were observed between LBP and the reporting of other somatic symptoms. After adjusting for age and gender, children reporting troublesome headaches for more than three days in the past month had a threefold higher odds of reporting LBP than those not reporting this symptom. Similar results were found for troublesome abdominal pain, sore throats, and high levels of daytime tiredness (table 5). The positively associated factors from the univariate analysis were entered into a multivariate model to identify those that were independently associated with LBP (table 6). Six factors were found to be independently associated with LBP (conduct problems, emotional problems, troublesome headaches, troublesome sore throats, daytime tiredness, and having a part time job). Hereafter, the prevalence of LBP was assessed in the whole study population according to the number of exposures reported (in the highest category). 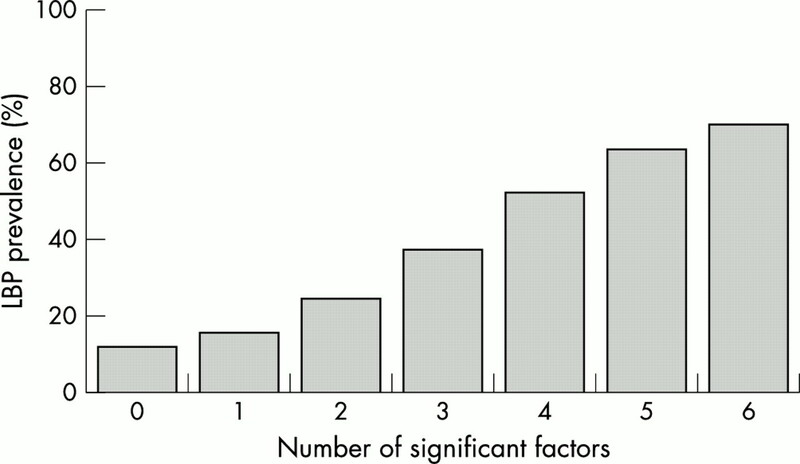 Prevalence increased monotonically from 12% among those with 0 factors to 70% among those with all six factors (fig 2). Prevalence of LBP by number of significant risk factors. This is the largest population based study which has assessed the association between both mechanical and psychosocial factors, and LBP at early ages. The two main findings of this survey were that mechanical factors were not associated with the reporting of childhood LBP whereas there were strong associations with emotional problems, conduct problems, and other common childhood complaints. The participation rate was high (97%) because the investigators were present during data collection to ensure all questionnaires were fully completed and returned. It is therefore unlikely that bias resulting from non-participation had an effect on the observed results. However, there are potential weaknesses. It could be argued that the outcome measure used (one month period prevalence of LBP) would include some relatively minor low back pain. However previously published work from the same study has shown that nearly all of the children who reported LBP also reported some related limitation to daily activities (94%).8 We were concerned about the validity of the mechanical and psychosocial measures employed. The completion rate of the bag weight diary by the children was good (78%). However, we were concerned as to how accurately the children weighed their bags over the five day period, and therefore the bags were measured on the first day by the investigators bags as a validity check. An additional analysis considering only the first day measurements also showed no association between mechanical load and LBP (data not shown) Therefore it seems unlikely that measurement error is likely to account for the “negative” results. Height and weight measurements for the calculation of BMI were taken by the investigators using calibrated instruments and standardised procedures. Somatic complaints (such as headaches, stomach aches, and musculoskeletal pain) have also previously been associated with emotional, disruptive, anxiety, and depressive disorders in a population of 4500 children aged 9–16 years.6 It could be argued that all of these complaints may be a reflection of distress, and thus there is a subgroup of children who are more likely to report pain of any nature—that is, the “painful person”. Furthermore, the findings suggest co-morbidity between LBP and other frequently occurring common childhood complaints. Both stomach aches and headaches are known to coexist in adults and children,20 although the reason for this remains unknown. However, our results suggest that this could be a manifestation of somatisation. The findings from our population study among children suggest that psychosocial rather than mechanical factors are important in reporting LBP among children. Further, LBP is most common among children reporting other frequent childhood symptoms and may be a marker of somatisation. Although our data do not provide support for mechanical load being a short term risk factor for LBP, we cannot exclude deleterious longer term effects, highlighting the need for long term follow up studies of populations such as this. The study was funded by The Colt Foundation and the Arthritis Research Campaign, Chesterfield, UK. KDW was supported by an MRC PhD Studentship. Taimela S, Kujala UM, Salminen JJ, et al. The prevalence of low back pain among children and adolescents: a nationwide cohort-based questionnaire survey in Finland. Spine1997;22:1132–6. Negrini S, Carabalona R, Sibilla P. Backpack as a daily load for schoolchildren. Lancet1999;354:1974. Troussier B, Davoine P, Gaudemaris R, et al. Back pain in schoolchildren: a study among 1178 pupils. Scand J Rehab Med1994;26:143–6. Grimmer K, Williams M. Gender-age environmental associates of adolescent low back pain. Appl Ergon2000;31:343–60. Viry P, Creveuil C, Marcelli C. Nonspecific back pain in children: a search for associated factors in 14 year old schoolchildren. Rev Rhum Engl Ed1999;66:381–8. Egger HL, Costello EJ, Erkanli, et al. Somatic complaints and psychopathology in children and adolescents: stomach aches, musculoskeletal pains and headaches. J Am Acad Child Adolesc Psychiatry1999;38:852–60. Brattberg G, Wickman V. Prevalence of back pain and headache in Swedish schoolchildren: a questionnaire survey. Pain Clin1992;5:211–20. Watson KD, Papageorgiou AC, Jones GT, et al. Low back pain in schoolchildren: occurrence and characteristics. Pain2002;97:87–92. Goodman R. The Strengths and Difficulties Questionnaire. A research note. J Child Psychol Psychiatry1997;38;581–6. Arrigi HM, Hertz-Picciotto I. The evolving concept of the healthy worker survivor effect. Epidemiology1994;5:189–96. Power C, Frank J, Hertzman C, et al. Predictors of low back pain onset in a prospective British study. Am J Public Health2001;91:1671–8. Croft PR, Papageorgiou AC, Ferry S, et al. Psychologic distress and low back pain. Spine1996;20:2731–7. Gunzburg R, Balague F, Nordin M, et al. Low back pain in a population of schoolchildren. Eur Spine J1999;8:439–43. Salminen JJ. The adolescent back. A field survey of 370 Finnish school children. Acta Paediatr Scand Suppl1984;315:8–122. Balague F, Dutoit G, Waldburger M. Low back pain in schoolchildren: an epidemiological study. Scand J Rehab Med1988;20:175–9. Salminen JJ, Okansen A, Maki P, et al. Leisure time physical activity in the young. Correlation with low back pain, spinal mobility and trunk muscle strength in 15 year old schoolchildren. Int J Sports Med1993;14:406–10. Balague F, Skovron ML, Nordin, et al. Low back pain in schoolchildren: a study of familial and psychological factors. Spine1995;20:1265–70. Mikkelsson M, Salminen JJ, Sourander A, et al. Contributing factors to the persistence of musculoskeletal pain in pre-adolescents: a prospective 1-year follow-up study. Pain1998;77:67–72. Huang RC, Palmer LJ, Forbes D. Prevalence and pattern of childhood abdominal pain in Australian general practice. J Paediatr Child Health2000;36:349–53. Waters WE. The epidemiology of migraine. London: Blackwell Publishing, 1974.